There are a number of things you can do to help manage your child's behaviour and ease their fears around visiting the dentist. Our children’s dentists share some advice for what to do before, during and after their dental appointments. Teething is a very normal process, though it can be tough. Your baby’s tooth has to break through the gums, which can cause them pain and distress. Here, our children's dentists explain the signs and symptoms of teething and how to cope with them. 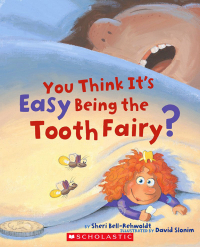 Book: You Think It’s Easy Being the Tooth Fairy? Sheri Bell-Rehwoldt's wonderful children's book You Think It’s Easy Being the Tooth Fairy? is the essential guide for every kid who loses a tooth! Here are a few tips for parents from our Smile Town Langley children’s dentist on how to handle baby’s first year of dental health. It can be tricky getting kids to brush for the full two minutes required for optimum oral health. Here are three great songs to play for your kids while they brush to make the process a lot more fun! Keeping their teeth and gums healthy as the grow into young adulthood should come naturally for teens who established good oral hygiene routines as children. That said, here are some tips from our Langley dentists on how to keep teens' smiles healthy.